Chuck-A-Puck is a fun and unique contest at the start of the second period break during Manchester Storm’s ice hockey games. Pucks cost £1 each (£3 for 4, and or £5 for 7) and can be purchased from the OSC Match Night Desk located near the food court under Block 113. PLUS – land the puck in the Bullseye on the ice to be in with a chance of winning a place in a grand final, where the winner will be eligible to an individual season ticket for the 2019/20 season! WHAT AN INCENTIVE TO BUY A “CHUCK-A-PUCK”!! 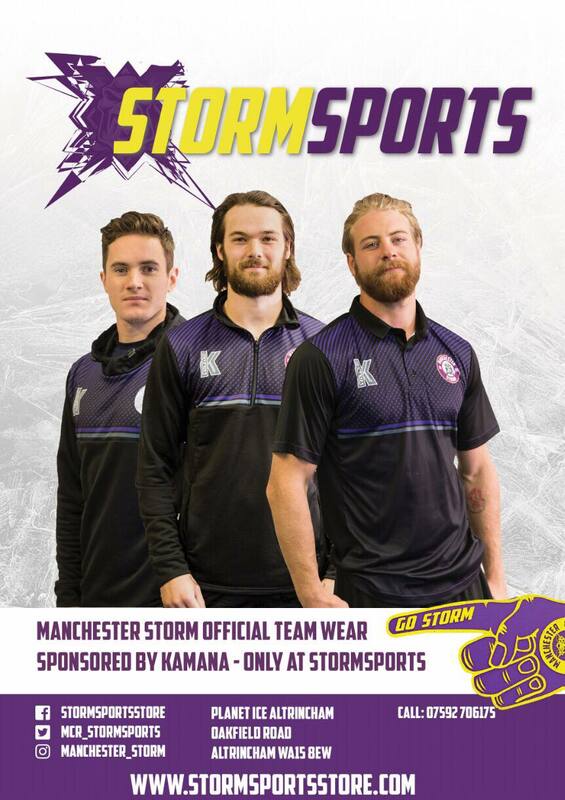 Each and every week you have the opportunity to win a cash prize whilst also raising money for your Manchester Storm. At £1 per ticket (half of which goes to the club and half to the prize fund) the prize up for grabs each week can vary depending on the amount of people who have entered. The more people who enter, the greater the prize and the more is raised for the club! 50:50 tickets are sold by roaming sellers both before the game and throughout both period breaks. The sellers will be identified through their colourful 50:50 selling bibs and can be found throughout the rink on game days. You can also purchase tickets from our OSC Ticket Booths, located near the GM Office under Block 112 and near Skate Hire under Block 107! The winner of the 50/50 draw is randomly drawn as always by a member of the Storm Management, and then announced during the third period. Each and every week you have the opportunity to win a players game-worn jersey, right off their back at the end of the game! For £1 per ticket, the lucky winner will get to choose which player’s jersey they wish to receive, and will also have the option of having the jersey signed by the player after it is presented to them on the ice! This draw is one of the only ways to get your hands on game-worn jerseys during the season! SOTB tickets are sold by roaming sellers both before the game and throughout both period breaks. The sellers will be identified through their colourful SOTB selling bibs and can be found throughout the rink on game days. You can also purchase tickets from our OSC Ticket Booths, located near the GM Office under Block 112 and near Skate Hire under Block 107! The winner of the SOTB draw is randomly drawn as always by a member of the Storm Management, and then announced during the third period. Can you beat Lightning Jack?! “Shoot the Puck” is a new match night game which is being introduced into the start of the first period break during Manchester Storm’s home games. 3 lucky fans will be selected at random by the MSOSC. Each fan will be given 2 shots to try and beat Lightning Jack by getting the puck through any of the 3 slots available in front of the goal. Each and every week you have the opportunity to win a players INTACT game used stick, out of their hands at the end of the game! For £1 per ticket, the lucky winner will be presented with the stick by the player on the ice, and will also have the option of having it signed once it has been presented! This draw is one of the only ways to get your hands on a genuine Manchester Storm Ice Hockey Stick during the season! Stick Raffle tickets are sold by our roaming seller both before the game and throughout both period breaks. You can also purchase tickets from our OSC Ticket Booth, located next to the OSC Desk under Block 113! The winner of the Stick Raffle draw is randomly drawn as always by a member of the Storm Management, and then announced during the third period.